Protects Trees: Xmas tree bags protects Christmas trees are shielded from damages, dust, moisture, and pests so it's always ready to show off. 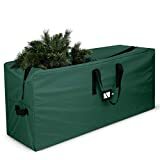 Dimensions 65" x 15" 30"
Reliable Durability: breathable zober artificial tree storage bags for large 9 Ft. tree made from canvas heavy duty, tear and waterproof fabric that'll lasts for many seasons to come. Easy carry: 3 stitch-reinforced handles (2 on the top and 1 on the side) make getting your storage bag for christmas tree between storage and living room hassle-free. Easy Access: Two way/dual zipper opens the holiday storage bag widely for uncomplicated placement and removal; no assembly required just unfold, and insert your tree for great tree bag storage. 65" x 15" x 30"